Ready to get out and go this winter? Here are 10 good reasons to visit the Great Lakes Seaway Trail National Scenic Byway along 518 miles of freshwater shoreline in New York and Pennsylvania. Find details on 50 festive, fun and fresh reasons to visit the Great Lakes Seaway Trail National Scenic Byway this winter, go to www.seawaytrail.com/winter. Anyone who lives, works or plays along the Great Lakes shoreline in New York can now sign up for Currents, a quarterly E-newsletter from New York Sea Grant. The new online resource – which will debut mid-August – highlights New York Sea Grant’s research, extension, education and information endeavors for New York’s Great Lakes and marine waters. The first issue includes items on Sea Grant’s clean and safe boating initiative, its unwanted medicines campaign, and efforts to educate the public about a variety of invasive species, from Asian carp to Hydrilla and water chestnut. Subscribers have the option to download an entire issue or individual articles of interest. Those interested can opt-in free of charge online at www.nyseagrant.org/nycoastlines. The Web site also includes the opportunity to electronically receive New York Sea Grant’s quarterly flagship publication, New York Coastlines. Both New York Coastlines and Currents will be E-distributed 3-4 times a year. New York Sea Grant (NYSG), a cooperative program of Cornell University and the State University of New York, is one of 312 university-based programs under the National Sea Grant College Program of the National Oceanic and Atmospheric Administration. Through its statewide network of integrated services, NYSG has been promoting coastal vitality, environmental sustainability, and citizen awareness about the State’s Great Lakes and marine resources since 1971. For updates on Sea Grant activities: www.nyseagrant.org has RSS, Facebook Twitter and YouTube links. It’s getting easier for hikers to navigate through parks and trails in Erie County. New signs along the Shoreline Trail offer a unique and consistent way for visitors to get information on directions and regional information. The signs feature maps and facts about the area. The 56 signs are along a trail of about ten miles. 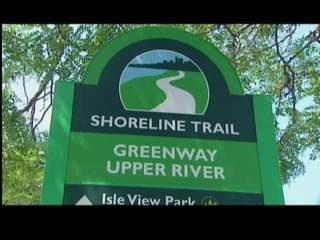 Click here for photos & info on the Shoreline Trail. What inspires someone to start hiking, or in Richard Gardner’s term, begin “learning to walk?” What compels one person to run marathons, another to thru-hike the Appalachian Trail, and yet another to circumnavigate lakes? This memoir provides a window into the motivation from Richard’s perspective, using flashbacks to formative events from his life. Richard began a habit of walking in two places in Rochester, NY – around a reservoir high on a glacial hilltop and on a beach along the shore of Lake Ontario. Walking allowed him to slow down and notice the small things. He shares these astute observations with his readers. As he walked, Richard learned to cope with life’s challenges and find joy in the natural world. Walking can do that to a person – re-root them – and inspire them to greater adventures. For Richard, these small walks led to a passion to hike around lakes. It also opened up a passion for writing. “Learning to Walk” is the first of a trilogy of books. In the next two books (available late 2012) he’ll be sharing his insights from hiking around Lake Ontario and Lake Erie. I’m hooked. 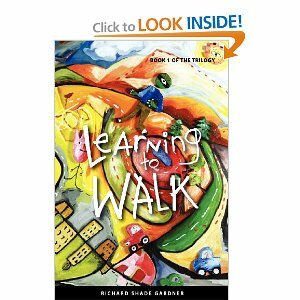 “Learning to Walk: Book I of the Trilogy,” by Richard Shade Gardner, is now available on Amazon.com in paperback and Kindle versions. It is also available at Simply New York, in Rochester, and Artizanns, in Naples. By Sue Freeman, thru-hiker of the Appalachian Trail, author & publisher of 14 outdoor recreation guidebooks to central & western New York State through Footprint Press, Inc. I looked at this photo & wondered what they were smoking – then I realized the Finger Lakes are at the top of the photo, so the photo is looking south across Lake Ontario from Canada. The book is 112 pages, with over 200 color photos, maps and art work to illustrate the narrative. Dufresne draws upon his 33-year background as an agricultural educator with Cornell Cooperative Extension to explain aspects of grape farming and the grape industry to the visitor. He includes information about the natural resources – where to gain public access to Lake Erie, enjoy the outdoors on hiking trails, chase the creek headwaters, and note the footprints of glaciers from the Ice Age. The book is broken into 18 chapters, including ones on local agriculture and the Amish Country, appreciation of country church architecture and old cemeteries, and geology of the region. 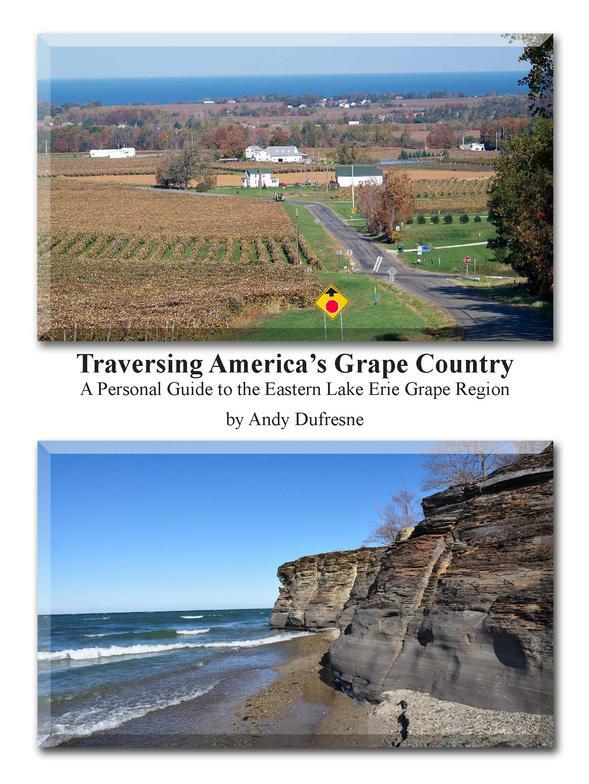 Dufresne highlights a dozen of his favorite vineyard vista photo locations. And he presents a 68 mile Grape Escarpment Scenic Drive Route that twists and turns from Sunset Bay, Hanover, NY to Shades Beach, Harborcreek, PA. Much of the route is on less traveled roads in the Allegheny Plateau Escarpment hills south of Route 20, offering a close-up view of grape farms and long views of grape vineyards. The route will be promoted jointly with the Lake Erie Concord Grape Belt Heritage Area. Dufresne is confident that people who have lived here all their lives will also discover some gems of unvisited locations worthy of a visit. And the information makes it a reference book to the local grape industry. The book measures 8 ½” X 11″ and is printed in color, with a soft cover. It was printed by Falconer Printing and Design, Falconer, NY. Dufresne hopes to have copies for sale in the area’s wineries and gift shops and notes that it is available at McClurg Museum, Jack’s Barcelona Drive-In, Arrowhead, Johnson Estate and Merritt Estate Wineries. The book’s list price is $34.95 and can be ordered (+$5 for tax & shipping) directly from him: Andrew Dufresne, 3965 S. Harold Avenue, Bemus Point, NY 14712, email and2@cornell.edu. It can also be ordered on-line, using PayPal at www.GrapeBeltViewer.com. A downloadable digital edition is expected to be available in the future.